Did Ted Cruz just use science to disprove global warming? Cruz believes that science disproves global warming. And he’s got proof: The recently-announced presidential candidate got his hands on some analyses of satellite data a while back. And now, as he tours the country, he has been sharing it all around to show good Americans that it’s all okay: They needn’t be afraid of the fact that 97 percent of climate scientists accept that human activity is warming the earth. The satellite data shows that that is simply not the case. The satellite data does indeed indicate that global warming has slowed in the last two decades. The senator is right. So what are we left with? Did Ted Cruz really just use science to disprove global warming? Is he, as he refers to himself, a Galileo of our time — a brave man who challenged near-consensus in the intellectual community, and was called a heretic before emerging righteous and validated? For one thing, Ted Cruz did not use science in his attempt to disprove global warming: instead, he used the results of a single research inquiry. See, when Cruz said, “Debates on this should follow science, and should follow data,” he was making a great point. Debates should absolutely follow science and data. But Cruz is only doing one of those things — he’s following the data, but not the science. Scientists (and most high school freshman) understand that “science” — which is to say, scientific truth — is never determined by the results of one study. What we regard as true in science comes from a rigorous set of tests, observations, experiments and replication attempts that, at the end of the day, all support the same model (or very similar models) of understanding: We accept that tectonic plates exist, not because one scientist looked at the continents and said, “Say, those might fit together like puzzle pieces,” but because decades of observation and inquiry — such as earthquake and volcano frequency — support the model of their existence. This is why 97 percent of scientists accept that global warming exists, and understand that it is caused by humans. All the evidence at scientist’s disposal fits the model for global, man-made climate change: from experiments showing the greenhouse effect of carbon-dioxide and examinations of previous atmospheres using ice cores, to observations of rising sea levels, increasing global temperature, warming oceans, shrinking ice sheets, declining Arctic sea ice, retreating glaciers and increasing acidity in oceans. So while satellite data showing that global warming has slowed in recent years puzzles climate scientists, it in no way shakes their acceptance of the scientific truth of climate change. Even the researchers who gathered and analyzed the satellite data do not believe that it disproves current understanding. 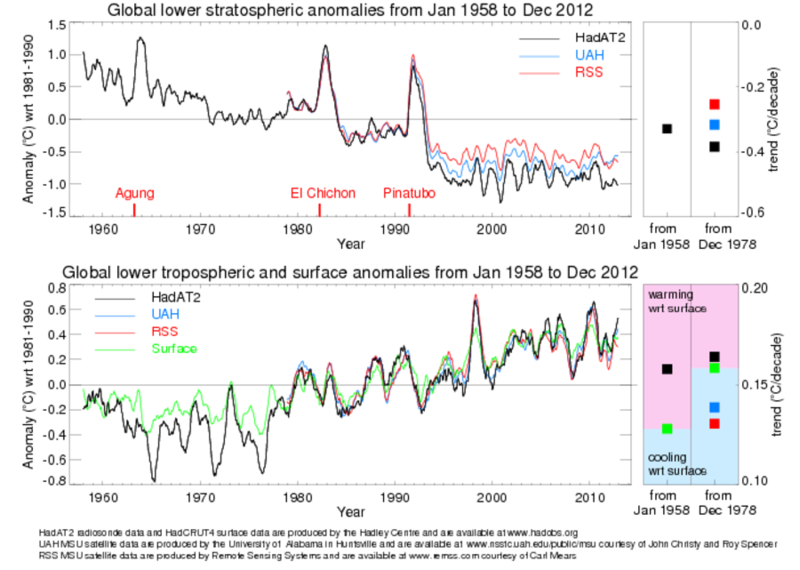 They lay it out simply: “Does this slow-down in the warming [shown in our data] mean that the idea of anthropogenic global warming is no longer valid? The short answer is ‘no’.” Indeed, scientists already have multiple theories to explain the slump of warming in the satellite data (the most prevalent being that temperature increases are manifesting in deep oceans). We can see that, overwhelmingly, accepted scientific theory contends global warming exists. But what about Cruz claiming he is like Galileo — a maverick archetype, like Copernicus, or Clair Cameron Patterson? “Today, the global warming alarmists are the equivalent of the flat-Earthers. It used to be [that] it is accepted scientific wisdom the Earth is flat, and this heretic named Galileo was branded a denier,” Cruz says. Is Cruz like Galileo for questioning “accepted scientific wisdom”? First, scientists, and those who accept science, are not branding anyone a heretic — they are simply stating that there is no current evidence that convincingly supports Cruz’s position. Second, everyone already knew that the earth wasn’t flat when Galileo was alive. They had already sailed ships around the world, which would have been hard to do if the earth was shaped like a quarter. Galileo was called a heretic because the evidence he observed through his telescope led him to accept Copernicus’ theory of heliocentricity. Finally, Galileo was not challenging “accepted scientific wisdom.” He was challenging religious mysticism: while Biblical evidence pointed towards the sun revolving around the earth, there was little credible scientific evidence to support a geocentric model. Therefore, Cruz is completely unlike Galileo — except in the fact that he disagrees with tons of people (and most Americans). While this romantic image of Cruz as the sole purveyor of truth may be attractive, it is simply not true, and we must resist entertaining it. Because if science is to persist as tool as powerful as it was for Galileo, then we must respect and understand what qualifies as scientific understanding. The senator’s delusion is a reminder to all of us: Solitary research results are not the same as scientific truth. Cruz is a fair target for ire because he is smart enough to understand science (yes, Senator Cruz is incredibly intelligent). His use of “satellite data” is not an honest mistake: It is a malicious attempt to delude us. It is no mistake that he says there has been no significant warming in the last 17 years: 17 years ago was an El Niño year, and the temperature spiked dramatically. If you look at the charts of satellite data, you will see that while the curves do not show a peak that challenges the 1998 peak, the global temperature trend is undoubtedly upward. We cannot let politicians delude us in this way. We must value legitimate scientific theory over ideological positions. It is the only way we can continue to build a true understanding of the world and our reality.